Aimpoint, the originator and worldwide leader in reflex sighting technology, has announced the addition of the new Aimpoint® CompM5™ sight to their professional product line. Powered by a single AAA battery, and weighing just 147 grams (5.19 ounces), the CompM5 takes its place as the most compact optic in the Aimpoint® Comp™Series family of sights. 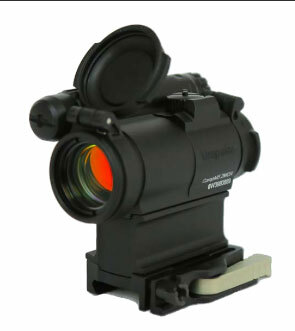 The CompM5 is fully submersible up to 45 meters (150 feet ), and is compatible with all generations of Night Vision Devices, as well as Aimpoint’s professional magnifier line. A military grade optical lens system gives the CompM5 exceptional light transmission and dot clarity, making the sight operationally parallax free, and providing a crisp, clear dot even under magnification. “The Aimpoint Comp Series has been established as the worldwide standard for military grade reflex sights for over 20 years. The new CompM5 sight provides professional end users the same levels of performance provided by our full-sized sights in a much more compact optic, ” said Lennart Ljungfelt, President of Aimpoint AB.